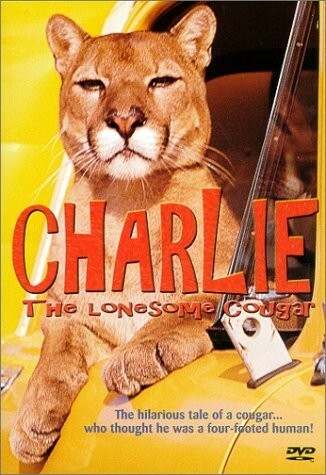 Charlie the Lonesome Cougar (film) In the Cascade Range of the Pacific Northwest, a tiny orphaned cougar kitten is found and adopted by a young forester. He names the cougar Charlie, and, as Charlie grows up, he has many humorous and hair-raising adventures in the logging community. Finally, for his protection, Charlie is given his freedom in a wildlife sanctuary. Released on October 18, 1967 on a bill with The Jungle Book. Field producers Lloyd Beebe, Charles L. Draper, and Ford Beebe. 75 min. Stars Brian Russell (Potlatch), Ron Brown (Jess Bradley), Linda Wallace (Jess’s fiancee). The film was narrated by Rex Allen. Released on video in 1985.